If you have to rename your CakePHP root folder for some reason, you might come across HTTP 500 Internal Server Error. This generally happens because of PHP opcode caching done by PHP accelerators for performance boosts. The problem can usually be fixed by restarting your server. If not, you might have to clear the PHP opcode cache manually. 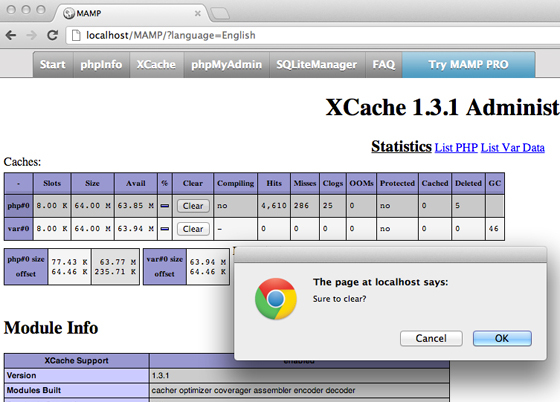 If you’re using MAMP (or MAMP Pro) on a Mac, which comes bundled with XCache, you can easily fix it by visiting XCache tab from server start page and using the clear button against the PHP cache. If you have a different PHP dev setup, check for other PHP accelerators like APC or eAccelerator. This will fix your problem and your CakePHP app will continue to function normally after renaming the CakePHP root directory.